This is a specialized collection of labor-related publications, mainly in social science containing 111,900 books in Japanese and 27,600 books in different languages, as well as 21,900 bound volumes of Japanese and Foreign journals. Days Closed: Saturdays, Sundays, Public Holidays, Year-End and New Year holidays. Users: The library is open to public. 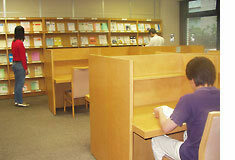 Loan Policy: A maximum total of five books are checked out for up to two weeks (both Japanese / Foreign books). Pealse show your ID or library card when you check out books. Copying Service: Self-Service (monochrome, only), 10 yen per sheet.